Soothing effective relief for sore throats.2,4-Dichlorobenzyl alcohol, Amylmetacresol, Levomenthol. 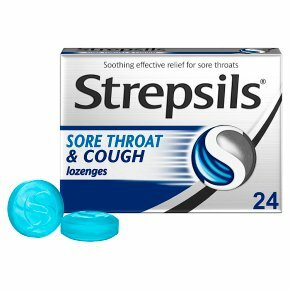 Strepsils®Sore Throat & Cough Lozenges contain two antiseptic ingredients (2,4-Dichlorobenzyl alcohol & Amylmetacresol) for use in throat medications. These are used for the symptomatic relief of mouth and throat infections and dry, irritating coughs associated with the common cold and nasal congestion. The Levomenthol ingredient has a mild local anaesthetic action on the throat and also relieves the symptoms of nasal congestion.